You'll be £15.00 closer to your next £10.00 credit when you purchase A Battle of Britain Spitfire Squadron. What's this? Formed at Rochford on 1 October 1918, just weeks before the Armistice that ended the First World War, 152 (Hyderabad) Squadron was originally a night fighter unit equipped with the Sopwith Camel. Its existence was short-lived, for the squadron was disbanded on 30 June 1919. With war clouds looming over Europe once more, 152 Squadron reformed at Arklington on 1 October 1939, becoming operational just over four weeks later. In January 1940, conversion to Spitfires began and after a period of defensive patrols in the North East, the squadron moved to Warmwell in Dorset to help defend southern England against attacks from the Luftwaffe forces now based in northern France. Throughout the Battle of Britain, the men and machines of 152 Squadron, call sign Maida, defended the Warmwell sector, which included the vital Royal Navy base at Portland, as part of 10 Group. It is the period from 12 July to 28 November 1940 that the author examines in great depth and detail in this definitive account. This, then, is the story of one squadron’s part in the struggle to defend Britain during those dark days in the summer of 1940. The author has been able to paint this picture and provide some fresh insight because of a narrower view than many histories that either cover a much longer squadron history than just one Summer, or attempt to cover several Battle of Britain Squadrons and Groups. 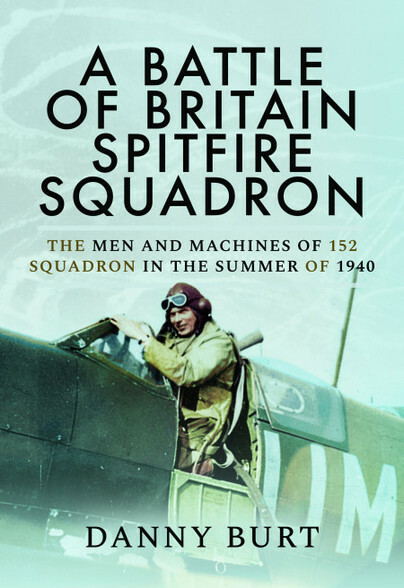 However, the men and machines that are brought to life are typical of fighter squadrons of the time through the RAF fight for Britain, making this much more than a squadron history. A fascinating story. Danny Burt joined the British Army at the age of 18. As a Fire Support Team member in the Royal Artillery he served in Kosovo, Bosnia, Iraq and Afghanistan, completing two tours in the latter theatre. Living in Lincolnshire, he is now a Joint Terminal Attack Controller evaluator. In his spare time, Danny collects and restores Second World War military vehicles and equipment.